An SPC-1 benchmark (PDF) run by Huawei shows it unable to answer lower-cost competition from three other Far East suppliers. An all-flash version of Huawei's OceanStor 5600 v5 array scored 1,100,252 SPC-1 IOPS, with a price/performance of $405.29 per KIOPS. 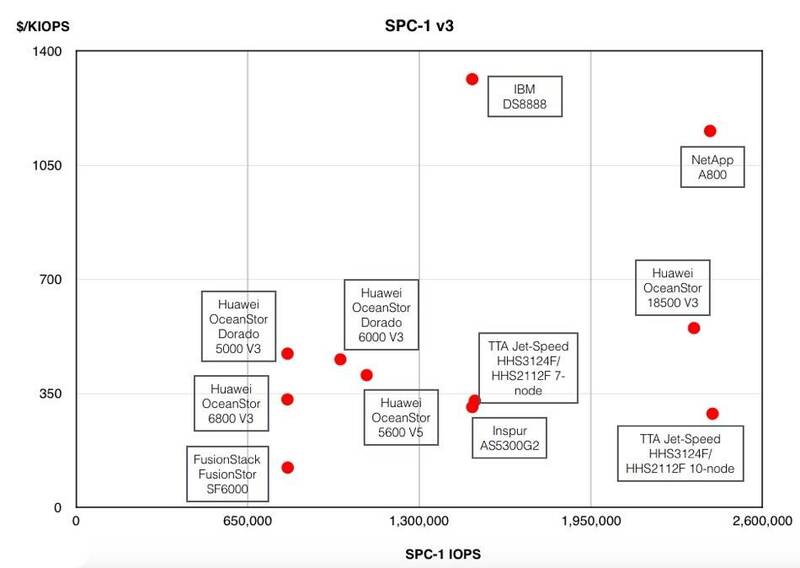 If we take an arbitrary IOPS range of 800,000 to 2.5 million SPC-1 IOPS, christening it the midrange, and look at the systems there we see 11 systems – one each from IBM and NetApp, five from Huawei, two from Korean supplier TTA, and one each from China’s Inspur and FusionStack. The top-scoring system was a TTA Jet-Speed HHS3124F/HHS2112F 10-node set up with 2,410,271 SPC-1 IOPS and a $287.01/KIOPS rating. Inspur's AS5300G2 was rated at 1,500,346 SPC-1 IOPS and $307.63/KIOPS. FusionStack's FusionStor SF6000 claimed $121.73/KIOPS, much lower than any Huawei system, and an 801,083 SPC-1 IOPS score.